Ross on Wye nestles in the South Herefordshire countryside and is an ancient town with panoramic views overlooking the River Wye. The town sits on a high on a sandstone cliff and has peaceful gardens and excellent walks beside the River. Ross has a long and varied history and first appears in records of 1016 and has a 13th Century Church and a Market House from the 17th Century. Ross-on-Wye boasts to having been one of the first recorded attempts to beautify a town for the benefit of its residents. 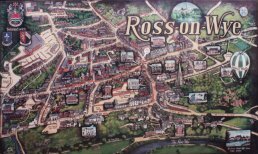 Originally it was known as "Ross" but became "Ross-on-Wye" in 1931 due to confusion with other places of the same or similar name. Ross-on-Wye came into the forefront of British tourism when it became a part of the Wye Tour and it remains a popular tourist centre right up to the present day. Many of the details and photos on Ross-on-Wye have been kindly donated; many thanks to all who have contributed to date. Ross-on-Wye was the birthplace of the British tourist industry. Tourism, which is the act of travelling for recreational or leisure purposes, is attributed to Dr John Egerton. He was the rector in 1745 and he started taking friends on boat trips down the Valley from the rectory at Ross just to look at the views. The Wye Valley's particular attraction was its river scenery and its precipitous landscapes. Additionally, its castles and abbeys, which were accessible to fashionable seekers of the 'Picturesque'; which is an aesthetic ideal first introduced into English cultural debate in 1782 by William Gilpin in Observations of the River Wye.